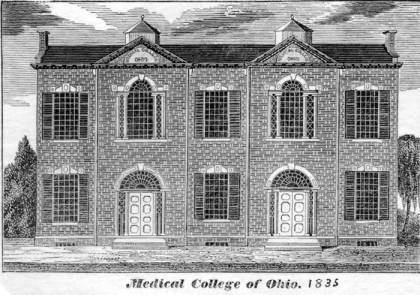 Difference between revisions of "Medical College of Ohio"
The Medical College of Ohio was founded by Daniel Drake in 1819 in Cincinnati. In 1920, the college changed its name to the College of Medicine of the University of Cincinnati. Daniel Drake founded the Medical College of Ohio in 1819 in Cincinnati. He also helped create the Commercial Hospital and Lunatic Asylum for the State of Ohio in 1820. Prior to the Medical College's establishment, most doctors learned their vocation through an apprenticeship system. Private doctors trained their students. Drake hoped to bring some of the finest doctors in the United States to Cincinnati to provide students with multiple perspectives on the practice of medicine. He also hoped that a diverse faculty would encourage discussion of medical practices and hopefully improve patient care. Drake served as president of the Medical College until 1823. The Medical College's faculty developed a strong dislike for Drake and voted to remove him as president in 1822, but the faculty members reversed their decision due to public uproar. Unwanted at the Medical College, Drake accepted a position at Transylvania University. The first several decades of the Medical College of Ohio's existence were rocky to say the least. The various personalities involved with the institution commonly clashed. Daniel Drake returned to Cincinnati in 1826, opening the Cincinnati Eye Infirmary in 1827. Over the next several years, he tried to form his own medical school in Cincinnati, hoping to drive the Medical College out of business. In 1835, he succeeded in establishing a medical program at Cincinnati College, but it collapsed in 1839. During the 1840s, Drake served as a professor of medicine at the Louisville Medical College in Kentucky. In 1849, he accepted a professorship at the Medical College of Ohio, only to resign that same year. In 1852, he rejoined the faculty at the Medical College of Ohio but died a few days after receiving his appointment. Another disgruntled faculty member, Reuben Mussey, established the Miami Medical College in 1852. For the remainder of the nineteenth century, the Medical College of Ohio and the Miami Medical College competed for students. In 1896, the Medical College of Ohio merged with the University of Cincinnati. The Miami Medical College also joined the University of Cincinnati in 1909, creating the Ohio-Miami Medical College of the University of Cincinnati. In 1920, the college changed its name to the College of Medicine of the University of Cincinnati. The Medical College of Ohio described in this article is not the same as the Medical College of Ohio (1964-2002), which merged with the University of Toledo in 2003.